The thymus is a lympho-epithelial organ in which the maturation of T lymphocytes takes place. 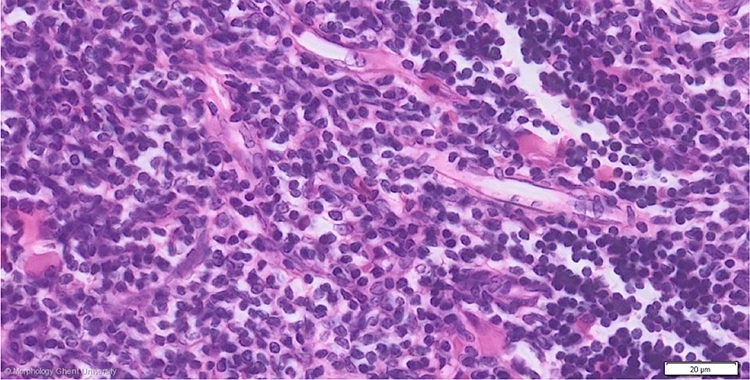 The stroma of the thymus consists of a network of stellate shaped epithelial reticular cells that are joined together by desmosomes. In between these cells, small T lymphocytes are packed. In adult chickens, the concentration of T lymphocytes in cortex and medulla hardly differs which makes it difficult to differentiate cortex and medulla from each other.